Hello, Swans Island Organic Washable. 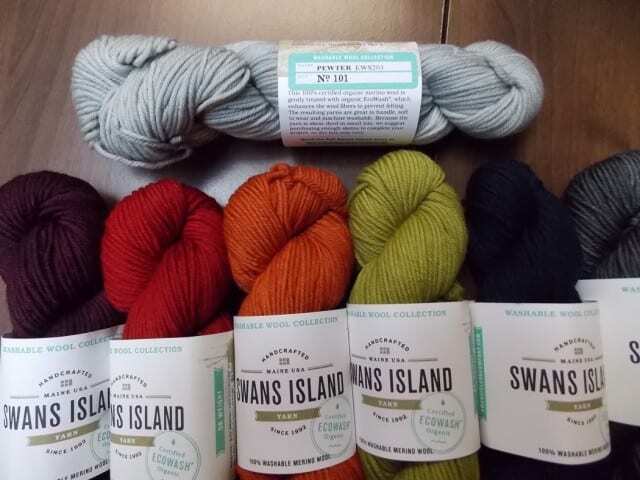 For three years now, we have visited the Swans Island booth at TNNA to place orders for their exceptionally soft merino yarns which are hand-dyed in Maine. Many of our knitters have made sweaters, shawls, hats, and mitts with these yarns, then come back for more, telling us how nicely they behave on and off the needles. 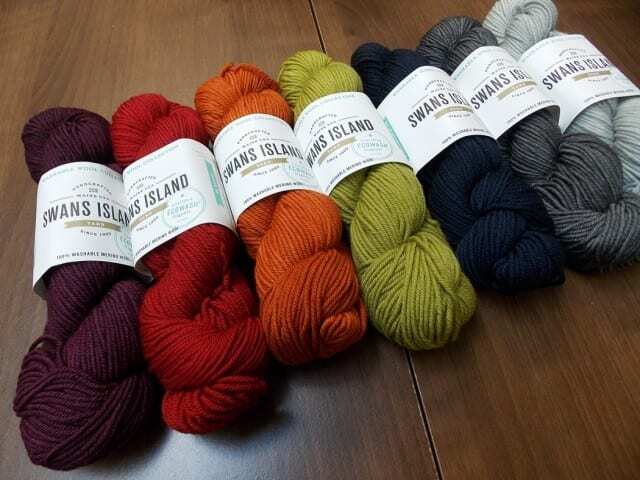 When we arrived at market this year to find that Swans Island had created a machine-washable yarn, we knew we had to have it. 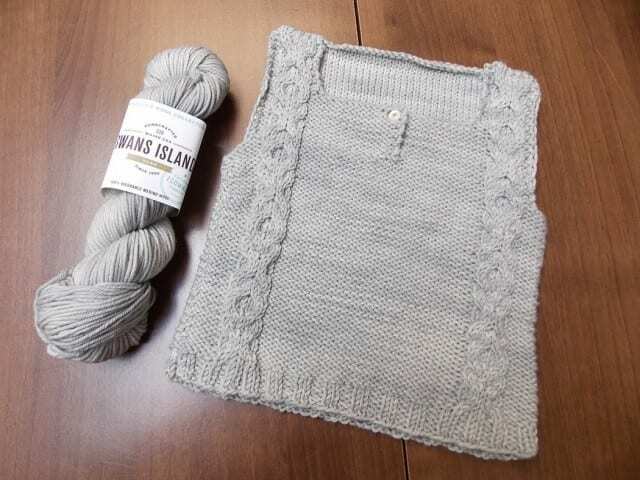 Swans Island have made this dk weight yarn machine-washable using a new-to-the-US process called Ecowash®, which coats the yarn with an organic compound rather than stripping the scales from the fiber. This helps to prevent felting and gives the Swans Island Organic Washable a softer hand than many other superwash wools. 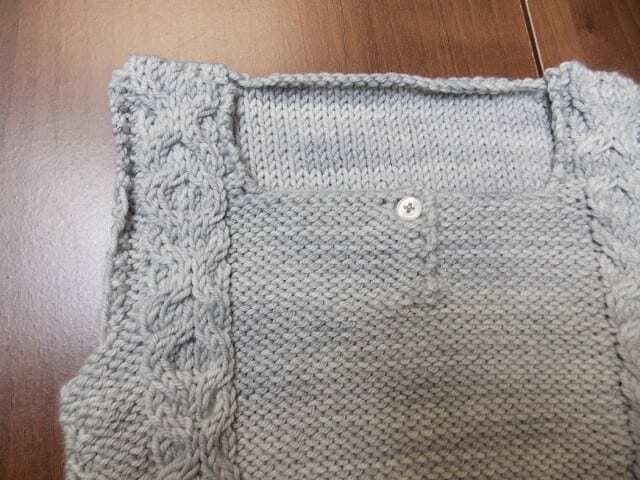 I knit a little baby vest for the shop using a few skeins we picked up at market, thinking how perfectly suited this yarn is to heirloom baby knits: buttery soft, minimally processed, organic, yet still machine-washable. I alternated skeins to keep this subtly semi-solid shade from pooling, and I’m glad I did; one skein was slightly darker than the other, and working back and forth between the two balls of yarn was a painless way to blend them. The pattern is “Cabled Vest,” from Susie Haumann’s All You Knit is Love, a collection of knits for babies ages 0-18 months. The pattern calls for two Isager yarns held together, but the gauge is 5.25 stitches per inch, which is perfectly achievable using a single strand of dk weight yarn. Besides baby things, Swans Island Organic Washable is perfect for adult garments as well as accessories. Its round shape and plump, springy quality give it excellent stitch definition for cables and other texture patterns. One 140 yard skein is plenty for a pair of Welting Fantastic Mitts, and another two will make a matching cowl. A Ravelry search sorting by gauge, looking only at patterns calling for dk weight yarns, kept me daydreaming for longer than I’d like to admit, scrolling through patterns for sweaters, shawls, and socks. 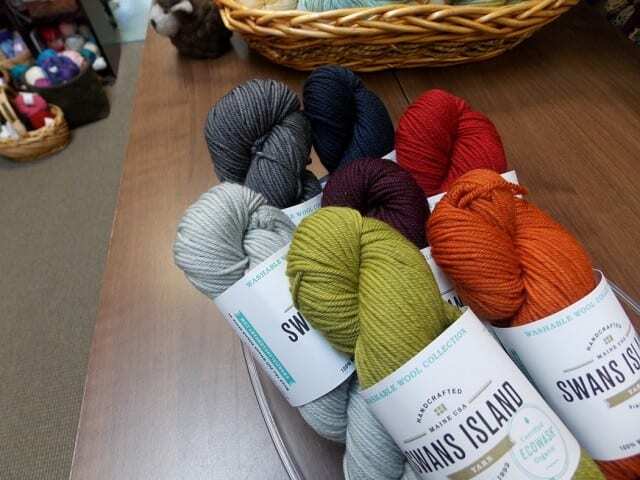 Look for the Swans Island Organic Washable yarn in the second room of the shop, sharing the spotlight with Alchemy and Smooshy with Cashmere. It’s an exciting time to visit the shop, as there seem to be new yarns arriving every week. See you there!